While my actions are in question, I found that Antihero is more than a game about committing crimes. 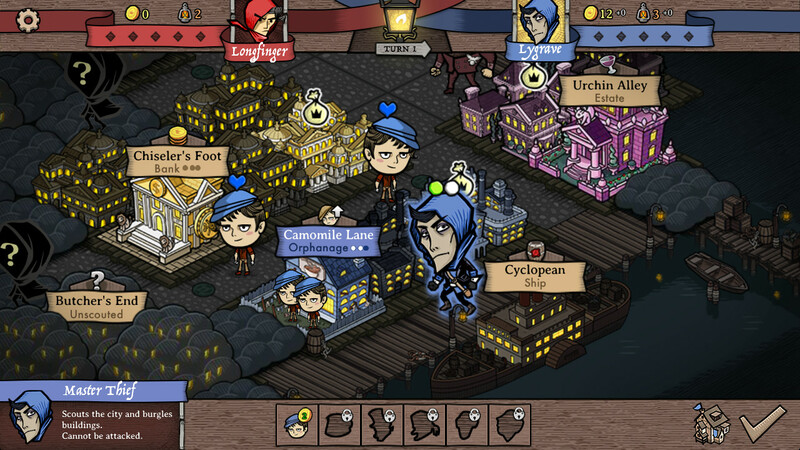 In Antihero, you’ll be tasked with battling it out amongst thieves for control of your town and title of Master Thief. Players can choose to journey through a single-player campaign or jump into the online multiplayer mode, which pits you against other aspiring master thieves to see who reigns supreme. 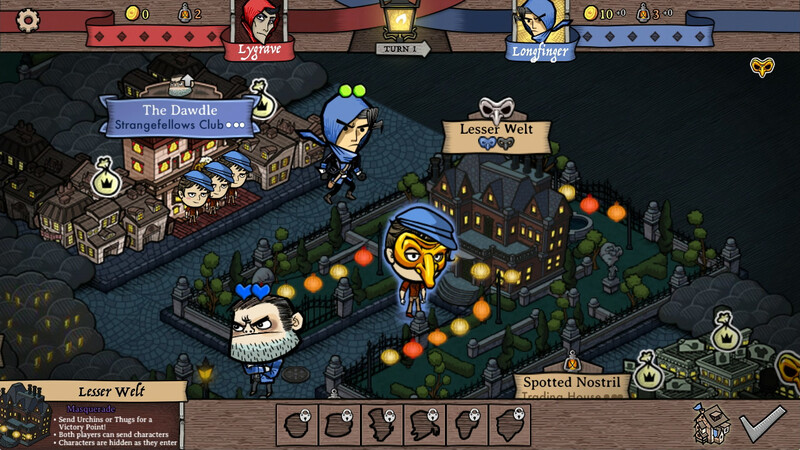 The gameplay of Antihero is not unlike most strategy games. Each player will take a turn performing actions until they’ve used up all their Action Points. As Master Thief, you can choose which areas to scout, when to recruit gangs and execute assassination contracts, among other things. The end goal of every match is to fill up your meter, each consisting of 5 slots before your opponent does. Antihero's battles take place across several beautifully designed maps. Each one begins with the master thief spawning from their guild location. At first glance, you will notice that a huge chunk of the map is covered in fog and silhouettes with question marks on them. In order for players uplift the fog, they must travel to that point and discover the area. Once the fog is gone, players can scout buildings and unlock various criminal actions such as infiltrating a building using an urchin. As for the silhouettes, these conceal henchman which you’ll have to eventually face, and unlocking the dagger ability will prove incredibly useful, as you can use that to hurt them, as well as your opponents. If getting your hands dirty isn't your style, Antihero also lets you recruit gangs. This turned into a real treat once I noticed that the character model for the gang leader resembles Daniel Day-Lewis' character from Gangs of New York! Overall, I was impressed during my preview with Antihero. It looks like its going to be a fresh take on an age-old concept that will provide a fulfilling strategy game experience, not only for PC but for mobile platforms as well. The only thing that I found to be more impressive than the game, is the fact that Tim Conklin is developing this title on his own, and has been working hard at it for over 4 years. If Antihero interests you, I encourage you to check it out through the first access program on the Versus Evil itch.io page. You’ll also be able to get your hands on Antihero for PC and mobile on July 12th, later this year. For more information on the game visit the Antihero website. If you like Antihero, we recommend these 5 must-play indie strategy games, get ready to face the apocalypse in Zombie Night Terror, and prepare to lead a band of wily barbarians in CRUSH YOUR ENEMIES!